Where do I go for my evaluation? Your evaluation will take place at the clinic that is closest to you. Click here to visit our locations tab to find the clinic nearest to you. If you have questions regarding the admissions process, please feel free to contact Walden’s main admissions office in Waltham, Mass., at 888-305-2997. The clinical evaluation typically takes 60 to 90 minutes. However, the process may take as long as five hours if laboratory data has not been received or if we are waiting to hear from the insurance company. The clinical evaluation includes a review of lab findings, an intake interview and a clinical assessment. Clinicians conduct the clinical evaluation. After your evaluation and receipt of your lab results, a clinical recommendation will be made. The clinician will call your insurance company for authorization of care at the level recommended by the evaluation team. At this time, the clinician may also contact your outpatient providers. Is my insurance going to pay? Your insurance company will be contacted for an authorization of care. When you first contact Walden Behavioral Care to schedule an appointment for an evaluation, we will ask for your insurance information so we can contact your insurance company and verify your benefits at the time of your evaluation. Please bring your insurance card and a license or other form of identification to the evaluation. We will advocate for authorization of an appropriate level of care based on your evaluation. Once we discuss your case with your insurance company, we will inform you of their decision. We encourage you to contact your insurance company in advance of your evaluation to educate yourself about your insurance benefits. Even if you are fully covered, co-payments and deductibles will be required upon admission. For additional information, visit our insurance coverage section. What happens if I do not want to use my insurance or if I don’t have insurance? For those individuals who choose not to use their insurance, and for those who do not have insurance coverage, we accept self-pay. Should you elect to use this option of payment, we will put you in contact with our billing office the day of your evaluation (or earlier, if you would like to speak with billing in advance). You may reach the billing department at 781-647-2941. Where should I get labs drawn and is the cost of labs included in the evaluation? We strongly recommend that you get your labs drawn 24 hours prior to your evaluation, through your primary care physician or a hospital. Having lab results prior to evaluation shortens the wait time for determining your level of care. If your primary care physician or other provider completes your labs they can fax the results to the Walden clinic where your evaluation is scheduled. If you feel more comfortable, you may also bring the lab results with you to the evaluation. Alternatively, if you are unable to have your labs completed prior to your evaluation our admissions staff will be able to identify an independent lab close to where you will be evaluated and will coordinate your lab draw appointment with them. If you are having your labs completed at the time of your evaluation we will schedule the evaluation as early as possible in the morning. Lab results may take up to five hours to return and level of care recommendation, insurance authorization and admission may be dependent on these results. **Please be aware that the cost of your labs is not included in the cost of the evaluation. Depending on your insurance, the coverage of tests may vary depending on if they are completed through your primary care physician or an independent lab. If you have questions about your coverage and potential cost, please contact your insurer and the office completing your lab work. Will I be admitted on the day I am evaluated? If your insurance company approves an inpatient or residential level of care, you will be admitted the same day, unless other arrangements are made with the admissions staff. For this reason, we ask that you bring your belongings, a full list of your medications and the medications themselves as well as a form of payment in addition to your insurance card and a form of identification. If your insurance company approves your admission to one of our outpatient programs, you would typically start the program the day after your evaluation. What should I bring with me in case I am admitted for inpatient eating disorder treatment after the evaluation? What should I bring with me in case I am admitted to the Residential Program after the evaluation? What should I bring with me if I am admitted to the Partial Hospitalization Program? On your first day of treatment, please bring contact information for your outpatient providers. Also please bring breakfast and lunch. Snacks, beverages and supplemental exchanges will be provided. Feel free to bring a book, knitting, journal or other items for your enjoyment. A staff member will meet with you when you arrive and present a full orientation to the program as well as answer any questions you may have. What should I bring with me if I am admitted to the Adult Intensive Outpatient Program? Please bring contact information for your outpatient providers. Also please bring your dinner. Beverages and supplemental exchanges will be provided. A staff member will meet with you when you arrive and present a full orientation to the program and answer any questions you may have. We strongly encourage family involvement in treatment. Your team will be assigned to you within 24 hours of admission, and your case manager will typically call your family to schedule a family meeting within 48 hours of admission. For adult patients, family involvement depends on whether or not you consent to their involvement in your treatment. Will my outpatient treatment team be involved? Your therapist/case manager will communicate with your outpatient treatment team before treatment begins to discuss the goals for treatment. They will consult during treatment to discuss your progress and at discharge. 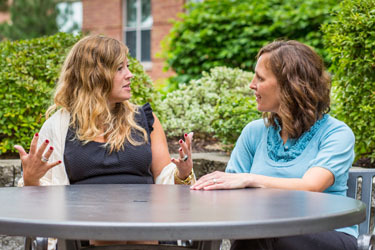 Patients on our Alcott Inpatient Eating Disorders Unit can have visitors from 6:15 p.m. to 8 p.m. Monday – Sunday. On Saturdays and Sundays, an additional visiting period is available from 2 p.m. to 4:45 p.m. Patients in our adult residential treatment program can have visitors from 7 to 8:30 p.m. on weekdays and from 1:30 to 3:30 p.m. on weekends. Adolescents in our residential program can have visitors from 6:45 to 8:15 p.m. on weekdays and 1:30 to 3:30 p.m. on weekends. Exceptions are made under certain circumstances on a limited basis through coordination with the case manager. Please click here to see a complete list of what you, your friends and family can and can’t bring into the inpatient and residential treatment settings. After reviewing the list, if you have further questions, contact the Alcott Unit nurse’s station at 781-647-6732.
Who is included in my treatment team? The treatment team depends on the level of care at which you are being treated. At the inpatient and residential levels of care, the primary treatment team will include a psychiatrist, doctor/nurse practitioner, nurses, a therapist, a dietitian and mental health counselors. At the partial hospitalization level of care, the primary treatment team includes a therapist, a dietitian, a nurse practitioner and mental health counselors. At the intensive outpatient level of care, the primary treatment team includes a therapist and mental health counselors.